Have you ever been completely baffled by the way your child is acting? Many parents struggle to understand and relate to children’s behavior, especially those challenging ones. Before you lose your cool and get frustrated in the heat of the moment, consider why your child is acting the way they are and what they are trying to communicate. This week, let’s explore one major factor that influences difficult behaviors: development! Aggression: In the moment, you are probably alarmed by your child’s aggressive behaviors. You may wonder where they learned to hit, throw things, or bite. It’s important to recognize, however, that young children act on impulse. It is developmentally appropriate that they don’t understand the impact that their actions have on those around them. In your child’s early stages of development, they are not capable of communicating their thoughts and emotions. So as your child begins to lash out, remember that it is likely a common behavior for their developmental stage. Your child may be frustrated and having difficultly expressing themselves! As they learn to communicate and learn about consequences, this behavior should begin to lessen. *TIP: Redirect! When your child is behaving aggressively, try to turn their attention to something more positive. Distract them so that they learn to put that negative energy into something productive. Clinginess and Shyness: Does your child hide behind you whenever they meet new people? Does he or she shut down when friends or family walk in the door? 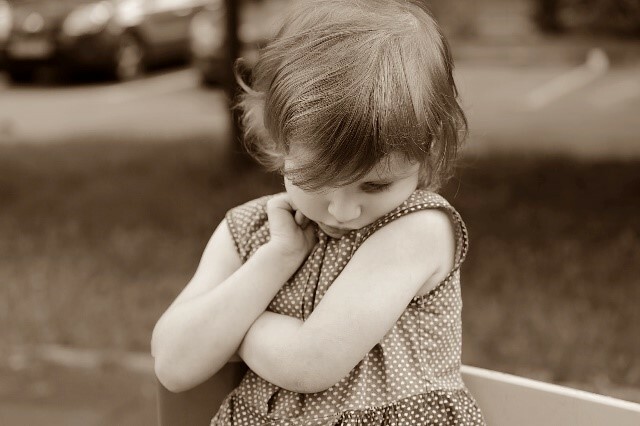 Shyness can prove to be a very difficult behavior for parents to handle and can hold both the parent and the child back in social situations. If you’re dealing with shyness on a regular basis, remember that all children experience and react to social situations differently. Some children are excited to be around new friends, while other children are more comfortable around familiar faces. We’ve discussed temperament previously. If you understand your child’s sociability, you’ll be much better equipped to address situations when their shyness is keeping them from normal childhood experiences. *TIP: Don’t force a shy child to be social. Instead of throwing them into something they are resistant to, work to make that situation more comfortable for them. The more you push, the more they will retreat. Cooperation: Sometimes we may expect our children to act in ways that are too mature for their age. Do you get frustrated when your child can’t sit calmly through church without running around or crying? A young child has a short attention span and needs stimulation. It’s unrealistic to expect them to be able to sit and focus for extended periods of time. Does it bother you when your child says “No!” when you ask them to do something? This is a time when they are learning rules, learning their limits, and learning how to assert themselves. Use these opportunities to teach them! *TIP: If a child is not cooperating or listening, ensure all of their needs are met. Are they bored? Are they hungry? Are they tired? Be sure to always be prepared with a book or toy, snacks, and regular nap/bed times.